I am using Acronis True Image 2017 on my PC which has two physical harddrives installed and an external USB drive. When I boot to the CD -- I can see the second harddrive and the USB drive, it is not seeing the C (Operating System) drive. What could be the problem ? Chris, welcome to these public User Forums. What type of drive is your C: drive? That is most likely the key to why the boot CD does not see it. Chris, sorry to repeat the same question but what type of SSD drive? If this is an NVMe M.2 SSD drive connected via PCIe then it may simply be a case that your ATI 2017 boot CD is too old to recognise this type of drive and does not have any device driver to support it. One option here would be to try creating the alternative WinPE version of the rescue media using the MVP Custom ATI PE tool (link in my signature) where this can allow to inject extra device drivers. If you are using Windows 10 the tool can take the PE files from your Recovery Environment otherwise you will need to install the Windows 10 ADK for PE support. I removed the other two drives and had only the C: drive attached to the computer. When I boot to the CD rom -- it tells me no harddrive is detected. I took a screen shot of the disk drives that are installed. The harddrive you mentioned is what looks like is installed. 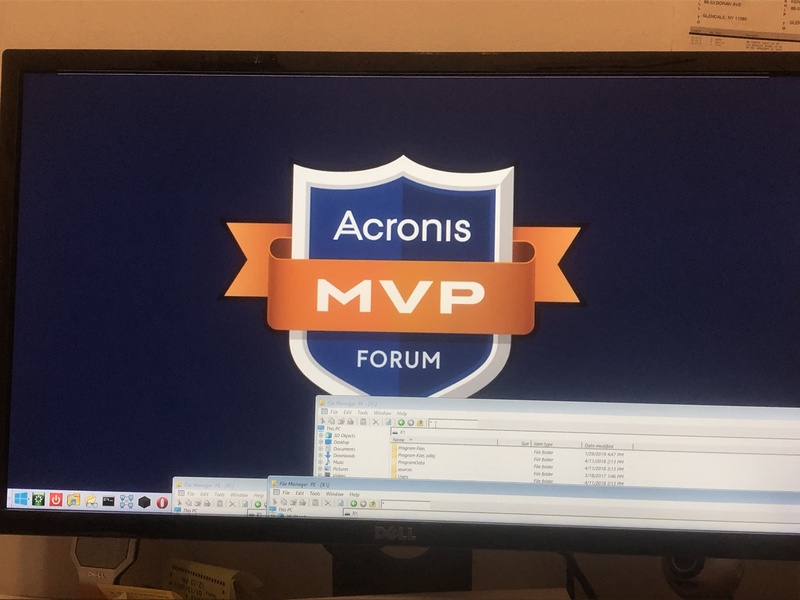 Chris, see forum topic: Acronis 2019 does not see my C drive - where another user had a very similar issue and this was discussed in great detail. I took a look at the thread from another user in this forum. I do not follow what I need to do. I do understand that I need to load the drivers so it can see the SSD drive when booting to the Acronis CD -- I do not follow how to do that. Just download the mvp builder and extract it to the root of any drive. Launch it and build custom winpe x64 following the menus. When prompted if you want to add custom drivers, pick yes and it will add the drivers you need automatically. It's really easy to use and I think you'll like the extra features this one incorporates too. If it is, I think I will need to download it and install it to see how it works. I think I am thinking outside the box which is why I don't follow. Chris, see the forum topic: MVP Tool - Custom ATI WINPE Builder here in the ATI 2019 forum which has a long description of what this tool does and a link to the latest version of the tool. This is my own primary rescue media builder tool that I use in preference to using the default builder tool provided within ATI 2019. To use the tool, download the zip file, extract the inner MVP_ATIPEBuilder_v186 folder to the root folder of one of your drives, open the extracted folder and use Run as administrator to launch the main MVP_ATIPEBuilder.exe application - no install is needed as this is a standalone program. When the tool application panel opens, select from the various menu options being shown, but in particular, take the option to install drivers from your computer so that you include those needed for your NVMe drive. The tool creates a text log file for each time it is run, the log is kept in the Logs folder as expected. I am not sure what to select. The problem I am having where the Acronis software does not see the C: drive is my parent's computer. Would I see something different is I ran the MVP_ATIPEBuilder.exe on my parent's computer? Chris, you would need to create the rescue media on the computer where you are having the problem with seeing the C: NVMe drive, this is so that you can pick up the device drivers needed to allow the drive to be seen. The above option is the important one for your situation as this is where you want to pull the drivers for the NVMe drive. After the above, you should probably decline the offer of adding MsiScsi and BitLocker support, then decide if you want to keep the prompt on boot for optical media, set the screen resolution before getting to the next important option. WARNING, ALL DATA ON DISK DRIVE N: WILL BE LOST! You should ensure that you give the correct USB flash drive letter as you do not want to format a different drive in the above step! Chris, did you select the option to install custom drivers or not? If you did, it should work on either pc now. If not, the is a key step you need to do from either machine. Otherwise, is your parents computer using an Intel CPU or an AMD CPU? If it's AMD we will need more info on the CPU and the computer make and model would be really helpful too (regardless of the processor type). Chris - we need your log file, or confirmation that you did or did not select "yes" when given the opportunity to install custom drivers. Select yes to add custom drivers is the key and that will work with 99.99% of the intel based systems out there. If you have a custom RAID controller in the Dell (A PERC controller, rocketraid, or something else), then you would need to manually add those drivers in the custom folder and then build the rescue media. Chris, the log file is showing that there is NO installation of Acronis True Image home on the machine it was built on. Did you build it on the system where Acronis 2017 is installed - that is a requirement as it needs the installed license to create and license the recovery media. With what you currently have, does it at least see your hard drive though? If so, then you just need to rebuild the recovery media where Acronis is already installed and licensed (your computer instead of your parents) and be sure to select Yes (again - you did this it looks like) to install the custom drivers when prompted. Chris, you need to create the USB media on a computer which has Acronis True Image installed, then this will be included on the USB media and can be launched from the same. As Rob has already mentioned, your log shows that this is not the case for the computer where you created the USB media using the MVP tool. The image below is how my USB media looks when ATI is installed. I created the USB tool using the MVP tool on the computer which is having the problem. I must not have loaded the Acronis utility onto the USB drive. Which option will load this to the USB drive when creating it? Chris, which version of Acronis is installed on the computer which is having the problem? The MVP tool will automatically add any supported Acronis programs that it can find without any need for user choice. The key information is the Acronis data shown above with version information that wasn't present in the log you uploaded to this topic. Chris, is Acronis True Image 2017 installed on the computer where you are using the MVP Tool to create the USB stick media? That is the key requirement here. The MVP Tool will work with the final version of ATI 2016 and with 2017, 2018 and 2019 versions. Chris, you must build rescue media on the PC that Acronis is already installed and licensed on. The log shows this was not done on the right computer. Until you do that, we can't help you. But once you do this, you will be fine. Yes, they have Acronis True Image 2017. They may not have installed this software package on their computer. I will check and do so the next time I am there. Awesome! You should be able to run the MVP builder after it's installed (AND licensed) and then it will be included into the rescue media the next time you create it. I recreated the bootable USB drive after I installed the Acronis software I was able to see all of the hardrives and back them up to the external USB drive. Thank you for your help and Support!! Chris, always good to read of success - thanks for giving the feedback. Woot! Glad to hear it. Excellent news; it took quite a while but it is now solved!